Castle Cove Co-op transformed the neighborhood when it was built upon the historic site of the former Boston Beer Factory. 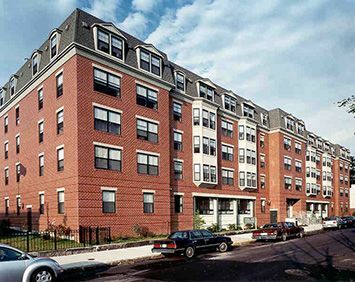 This 5-story community with 65 apartments is located on the corners of D and West Second Streets in South Boston. This is a 62+ community living cooperative which is recognized as “A Community of Quality” by the National Affordable Housing Management Association. This co-op was completed in 1997. Castle Cove Co-op Apartments does not allow smoking in any common areas, and within 25 feet of the building. Members in this community enjoy participating in many activities; bingo, card playing, Wii games, ping pong, shooting pool and board games just to name a few. There are events and parties which include lunches, dinners and of course, desserts. The co-op van committee organizes trips for shopping and pleasure. Private spacious apartments, some of which are appointed with bay windows and/or walk-in closets, are a serene oasis in resident members busy lifestyles close to downtown Boston. Castle Cove Co-op is just minutes away from the expressway that enters the heart of Boston. The “Jet Setters” head off to the Doc Tynan Senior Center which is just a few blocks away. Castle Cove Co-op is affordable for everyone. Every unit has subsidy and resident members pay only 30% of their income for rent. So don’t wait! Call for tours and join us today! Castle Cove Co-op is proud to be recognized as a NAHMA Communities of Quality Corporate Partner. This designation is for multifamily properties that have achieved a high standard of excellence in the way they are managed, the services they provide residents, the experience and training of personnel, and other criteria.